Wholesome natural hypo-allergenic dog food. 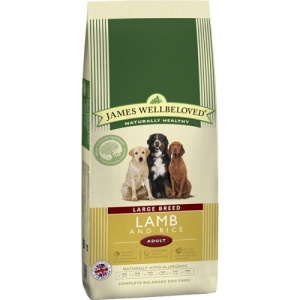 James Wellbeloved Large Breed Lamb and Rice helps loose bowels and calms itchy irritated skin and coat. Regular feeding with James Wellbeloved dog food has always been the traditional way to calm a dogs digestion and help avoid allergic skin irritation. James Wellbeloved Lamb & Rice Kibble is a pure natural complete dry food of succulent lamb and brown rice. Barley is also added as a source of fibre and seaweed alfalfa and yucca all bring health benefits.